Dancers from Edinburg Folklorico dance group wear paper macho masks as they participate in the parade during the annual Los Muertos Bailan festival at the Edinburg City Hall Courtyard on October 27, 2017, in Edinburg. EDINBURG — A colorful annual tradition in its fourth year was celebrated Friday evening at the City Hall courtyard. 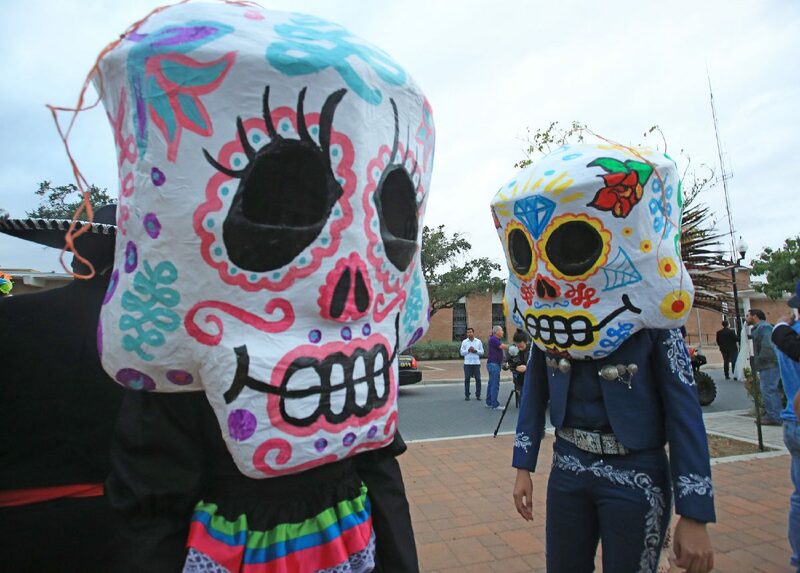 The city of Edinburg in-conjunction with the Dustin Michael Sekula Memorial Library’s arts division held “Los Muertos Bailan” celebrating Día De Los Muertos or Day of the Dead. It featured folkloric dance performances by the local high schools and Edinburg Parks and Recreation, food booths and the arts, such as face-painting and a sand mural on display. Letty Leija, director of library and cultural arts, said the event is to celebrate those who have passed on. Dancers from Edinburg Folklorico prepare to participate in the parade during the annual Los Muertos Bailan festival at the Edinburg City Hall Courtyard on October 27, 2017, in Edinburg. Dancers from Oaxaca, Mexico, participate in the annual Los Muertos Bailan festival at the Edinburg City Hall Courtyard on October 27, 2017, in Edinburg. 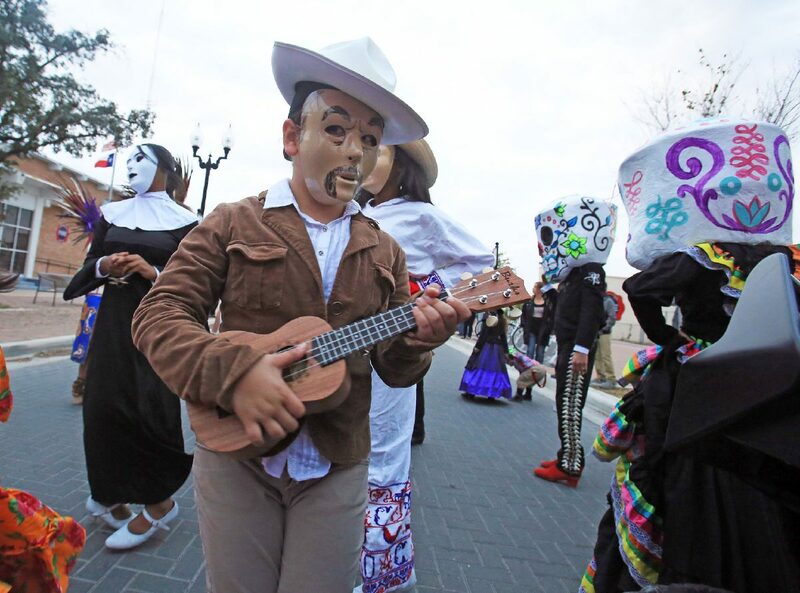 Performers participate in the parade during the annual Los Muertos Bailan festival at the Edinburg City Hall Courtyard on Oct. 27, 2017, in Edinburg. 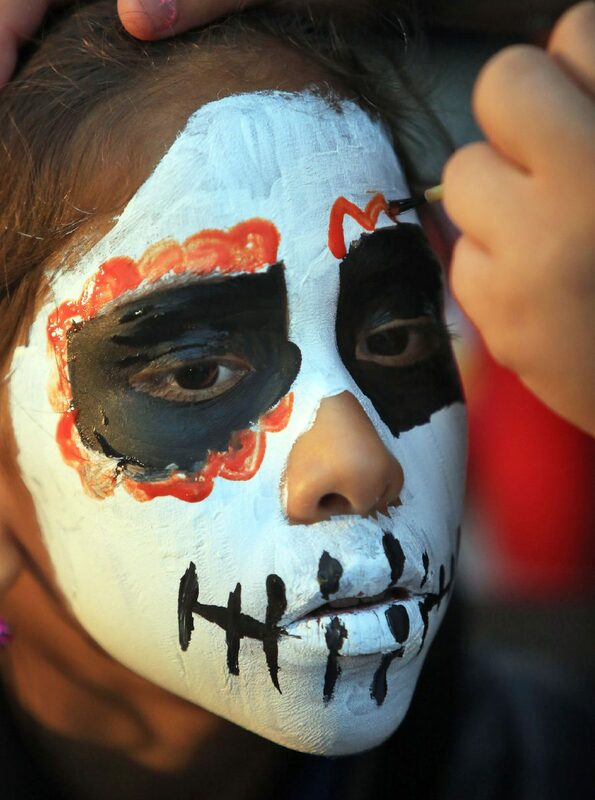 Katelyn Solis, 11, has her face painted during the annual Los Muertos Bailan festival at the Edinburg City Hall Courtyard on October 27, 2017, in Edinburg. 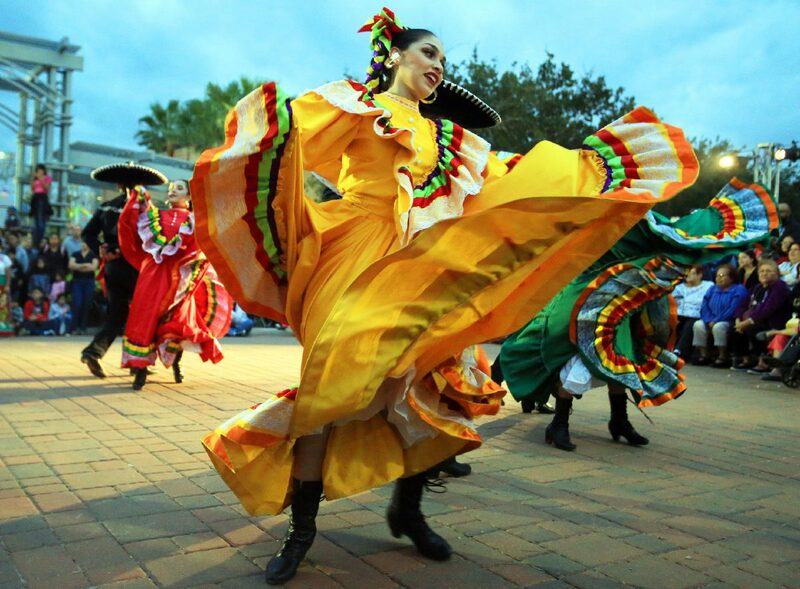 Dancers from Edinburg Folklorico dance group participate in the parade during the annual Los Muertos Bailan festival at the Edinburg City Hall Courtyard on October 27, 2017, in Edinburg. 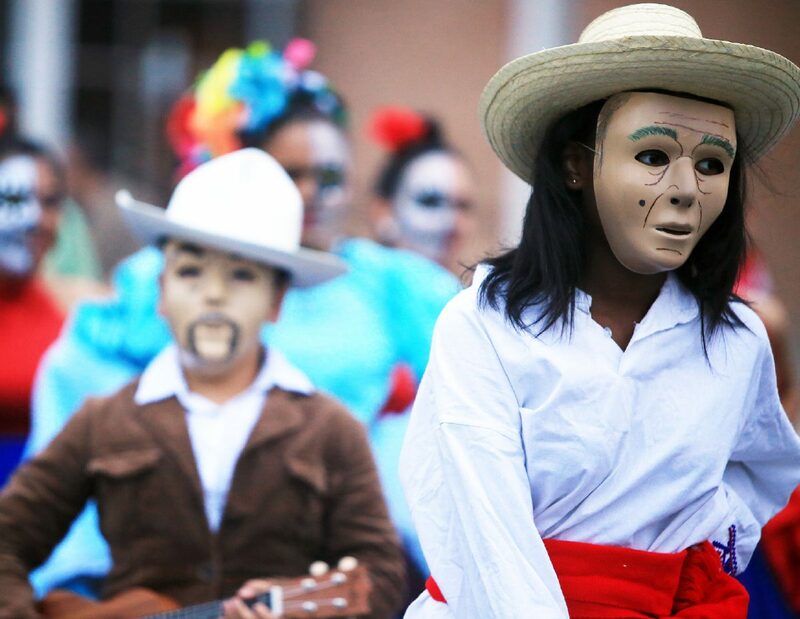 Folkloric dancers from Economedes High School participate in the annual Los Muertos Bailan festival at the Edinburg City Hall Courtyard on October 27, 2017, in Edinburg. 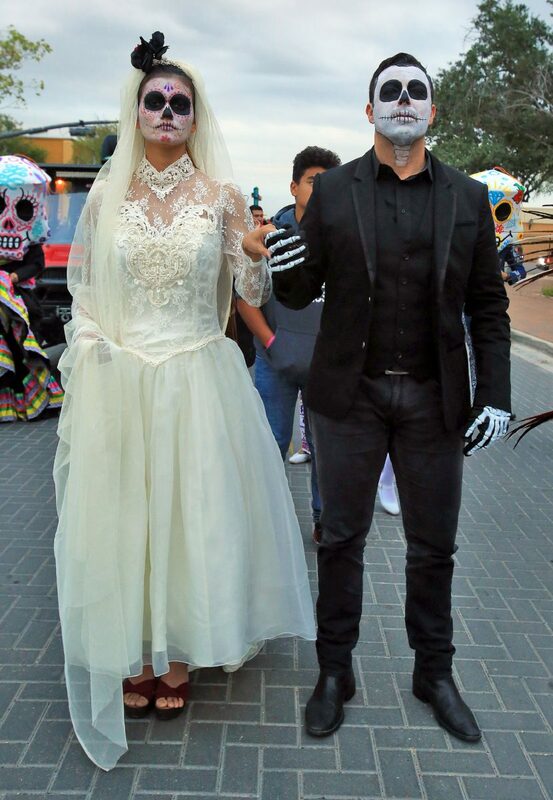 Some of the other festivities included a catrin and catrina costume contest, an altar exhibition and featured local artisans. Edinburg resident Julio Cortez attended the celebration with his family because some of his family members were participating in the parade while the rest of the family enjoyed a night out. New this year, representives from Oaxaca, Mexico, shared their Day of the Dead culture with the city and took part in local celebration here. Oaxaca is also known for their yearly calenda, a street parade held there for Día De Los Muertos. This was the first year Edinburg incorporated a mini-parade, which traveled down McIntyre Street from 10th Avenue to 8th Avenue east of city hall, into the celebration. Among the crowd, Jorge and Francis Garza, of Edinburg, were preparing to watch the parade with their children, nieces and nephews. They attended to experience something different and decided to stay for the festivities after the procession. The group from Oaxaca also performed a dance number inside the auditorium as a way to share some of the traditions here. 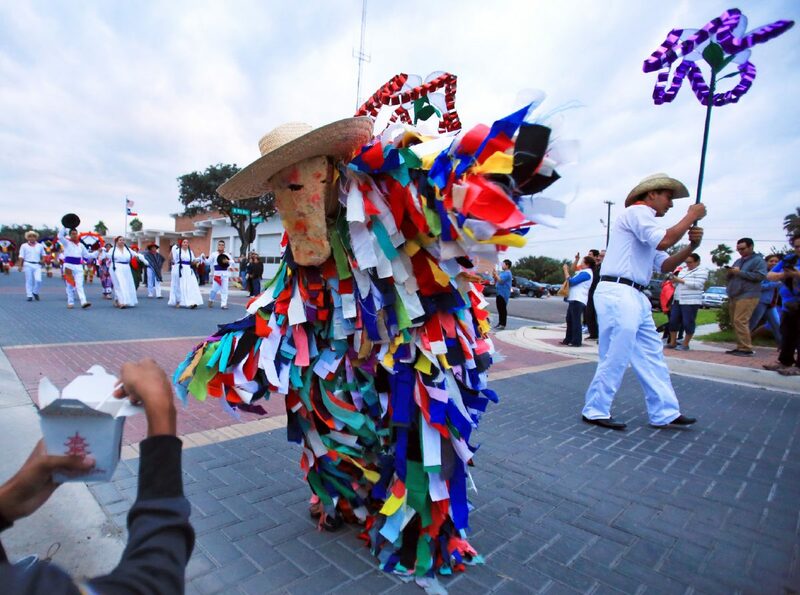 They performed La Guelaguetza, a combination of the pre-Hispanic celebration of Centeotl, the corn goddess, and the traditional Catholic feast day of Our Lady of Mount Carmel. Guelaguetza is an indigenous word meaning offering, which is symbolic of friendships.